A repeat of last year's 4th running of the Oasts and Coasts 300 starting at Meopham Scout Hut organised by Tom Jackson and friends. A 6am start giving you 14 hours of daylight, with an undulating route over the beautiful North Downs at Toys Hill, past Hever Castle and across the Ashdown Forest to a cafe control in Uckfield. Then further undulation through to Battle and Brede before a descent into Rye and a flat section across to Hythe at the half way point. From here climb Capel Le Ferne and descend with views to France on a good day to pass Dover Castle. Enjoy a lovely route on quiet roads along the coast through St Margarets and Deal to Sandwich before crossing to the north Kent coast at Birchington. Ride the traffic free sea wall and roll on to Herne Bay for your last cafe feed on the seafront. The return will take you through Whitstable, Seasalter, Faversham and then inland through Doddington to slowly climb before the descent of Hollingbourne Hill. The Pilgrims Way will take you across to the Medway where you cross via the M2 cycle path and from Cuxton we take the lanes back to the Meopham finish. 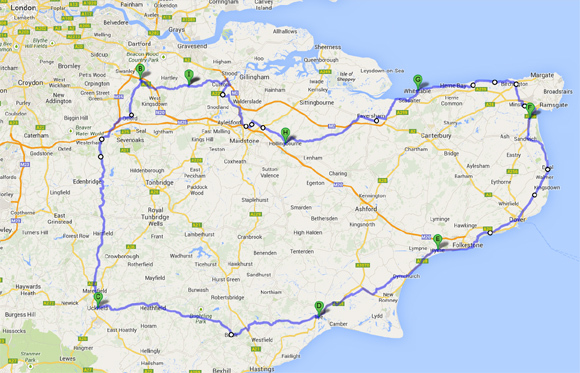 A good chance to take a look at the Kent coastline and experience some great roads. The first 100k is definitely scenic. Hopefully a SW tail wind will follow you from Uckfield around to Dover; then drop at Herne Bay for your evening return! The start and finish at Meopham Scout Hut provides parking and easy access by rail and road. Hot drinks and snacks before the 6am start, and soup or similar at the end included in the entry fee.